The banzai skydiving videos encountered on YouTube are mainly what they call a no parachute dive. By definition, there is no such thing as a no parachute jump. According to the United States Parachute Association, a “ skydive” or “parachute jump” entails jumping from an aircraft to the surface using or intending to use a parachute. At best we have a diver exit with no parachute. Anomalies arise too. When conducting a search for, “banzai skydiving” the results returned are tandem jumps. That is a form of skydiving used for training students and introducing newcomers to the sport. A tandem parachute system uses a harness designed for two people. The # 1 video Banzai Skydiver is trying to secure is the Yasuhiro Kubo video breaking the banzai skydiving world record. We have contacted everyone we could think of, and it paid off. We know that Kubo was on the Japanese Guinness Book of World Records TV series performing the Sept 2, 2000 record. It is taking some time for people to respond. We hope to have the video for you sooner than later. James Bond faces danger again in Moonraker. Moonraker opens with a banzai skydiving sequence which was shot entirely in free-fall with the exception of a few close-ups. It’s Banzai Skydivers # 1 video. It took 88 jumps and five weeks to film. This sequence matches closely with our mental image of what a banzai skydive is. That is to fly to jump altitude, throw the parachute from the plane and dive after it. The basic mechanics of a banzai jump. The pilot would account for the only banzai skydiving death in the movies. Point Break uses the mechanics of the banzai jump. Johnny (FBI Agent) is left in the plane with no parachute after Bodhi and Roach jump over San Felipe to escape the police. 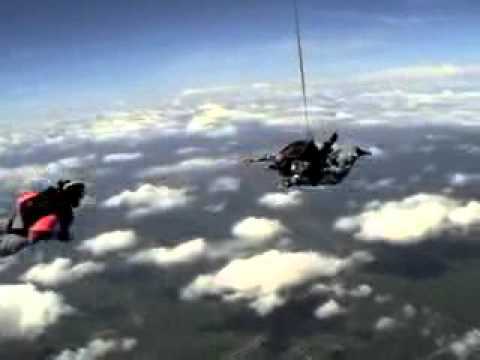 Quickly passing over the drop zone, Johnny makes the decision to grab Bodhi’s gun and jump after him with no parachute. Johnny swoops after Bodhi docking. Bodhi forces Johnny to drop the gun and they glide to safety. What starts as a banzai jump actually ends as a tandem jump. The two stunt men performing the stunt actually wore a modified tandem harness. Domain Ad remake for Film Riot is a banzai skydive with a switcheroo ending. Our disgruntled observer is sure to follow the skydiver out to talk some sense to him on the way down. Close to the projected landing point, our observer pulls the switcheroo and leaves our skydiver without a parachute. No worries for the skydivers. The commercial was shot with both men standing up against a green screen. A banzai jump was acted out in front of a leaf blower with the camera tilted on its side. Clouds and floating effects were edited in to finish the sequence . 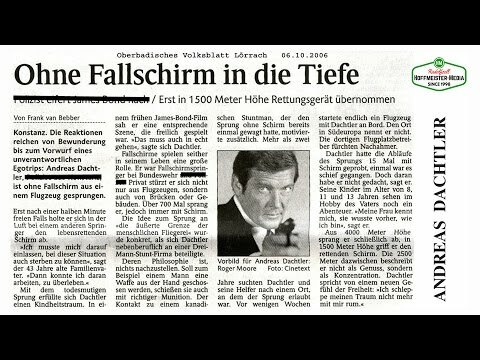 Andreas Dachtler does a good job. Banzai Skydiver Magazine doesn’t consider this to be an official attempt at a banzai jump or to be a banzai skydive; however, we give it a banzai. It gives you a very good feeling. The jump takes place in Southeast Europe at an altitude of 12,000 ft. (3657.6 m). Divers exit together with a crewmember holding the parachute. The sequence is very well choreographed and they pay very close attention to safety. After attaching a special harness, he glides to the projected landing point- thumbs up for Andreas Dachtler. Scott Palmer enjoys the skies over Ensenada Mexico without a parachute. 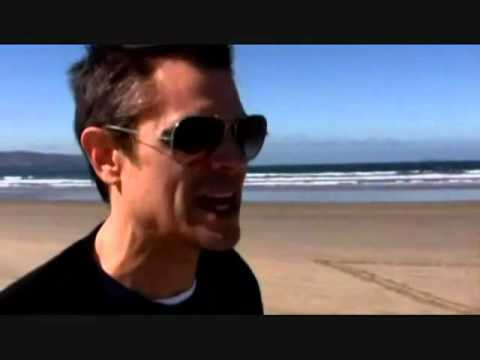 He performed the skydiver stunt for the TV show Jackass. He was in free fall for 40 seconds. Crew members and Palmer jumped from the aircraft with one member wearing a special tandem harness. After 40 seconds had elapsed, the crew member swooped to dock with palmer and secure him to the harness. No pun intended – everything went off without a hitch. Palmer and crew glided to safety at the projected landing point. Congrats Alan Eustace. Winning a world record for highest skydive is not a trivial matter. Eustace has purchased his ticket in the Reapers Lotto and lost for the advancement of humanity. As one watches Eustace rise from the ground to new heights, literally, it’s not hard to imagine a robot being lifted into the stratosphere. His space suit gives a sci-fi look to his rig attached directly to the balloon. Maybe even a sophisticated doll crafted in Hollywood being filmed with a high speed camera. Whatever the case, it begs the question, “Can all of us space jump as a sport?” Some say no! Banzai Skydiver believes if the technology becomes available and cheap enough, it may just become a sport. Felix Baumgartner earned his place as a banzai skydiver participating in the Red Bull Stratos space diving project. 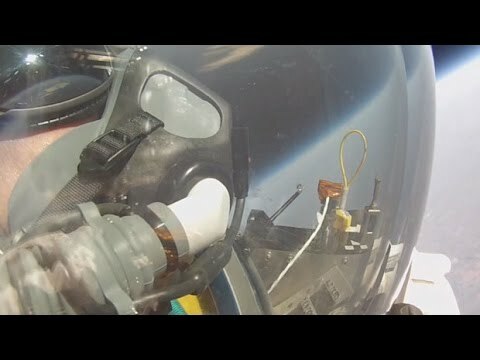 The space jump is not a banzai skydive, however our research shows that the act of skydiving from a jump altitude of 24.2 miles (38.94612 km) is banzai. Baumgartner has thrown in the towel for stunt work. Standing on the edge of Earth has given him a new appreciation of life. It maybe a wise decision; research has shown engaging in extreme world record skydiving events earns you a ticket in the Reapers Lotto. 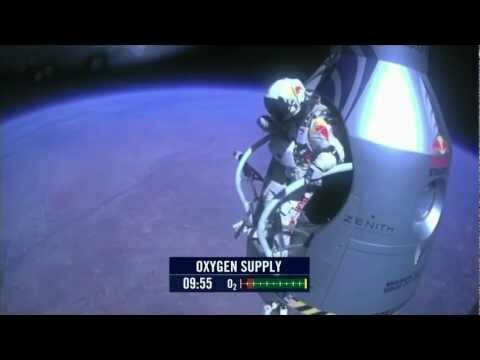 Felix Baumgartner has sold his ticket. Don Kellner is a banzai skydiver. His record of over 40,000 skydives has earned him a place in the Guinness Book of World Records. He’s a natural for parachuting. Kellner and parachute are one in the same. I don’t think he’ll ever attempt the no parachute skydive. He doesn’t have too. He has become one with the parachute. As a world record holder, the Reaper has also given him his Lotto ticket. In the U.S. 1 out of every 150,000 skydives ends in a fatality. At over 40,000, Kellner has nearly 1/3 the number of the statistic. Samantha has placed Don Kellner in the banzai skydiving death category by sheer number of jumps.